A beermosa is the perfect way to highlight the virtues of fruit flavored craft beer. Read on for tips and inspiration ideas. A beermosa bar will easily elevate your brunch. Beyond the obvious fact that a beermosa is a mimosa with beer, you’d want to consider your options for mixing one. How do you make a Beermosa? The key to mixing a beermosa is to select a well-suited, flavorful craft beer. The more flavorful it is, the better. A great beermosa appeals to all the senses and at its core is a flavorful, fruity ale. 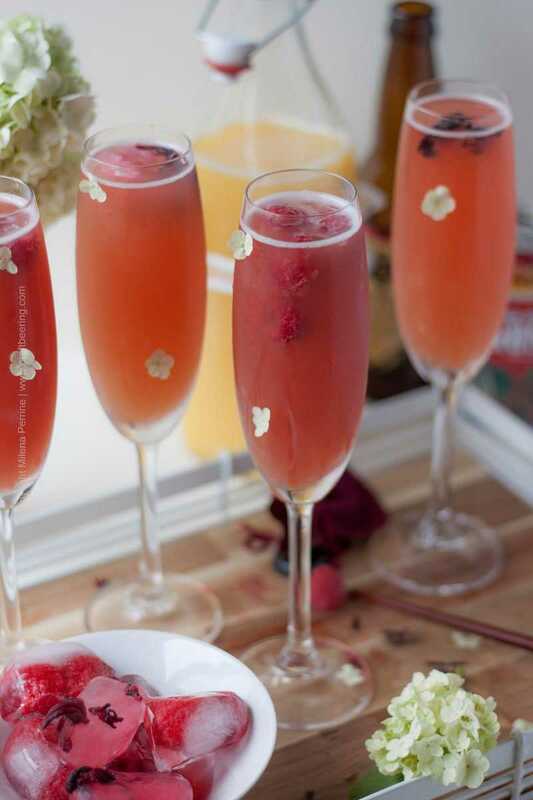 With a few exceptions, ales, rather than lagers are typically used to make mimosas with beer. The reason is that lagers are fermented by clean, top fermenting yeast strains which do not add fruity esters. The opposite is true of ales – many styles among them, especially Belgian ales and both German and Belgian wheat ales are fermented by yeast strains that contribute wonderful fruit aromas. Additionally, fruit conditioning is much more commonly done with ales, so when you are selecting a fruity beer the overwhelming majority of your options will be ales. To mix the perfect beermosa follow the steps below. Step 1. Choose a fruit flavored ale that appeals to you. For this post I selected an imperial raspberry saison and a blood orange gose. The spicy, fruity saison yeast esters, the aggressive fruit conditioning in combination with the dryness and the high ABV were beyond ideal for a beermosa. The blood orange in the gose imparted a more mellow, nicely fruity tartness to the base ale and seamlessly integrated with the orange juice. 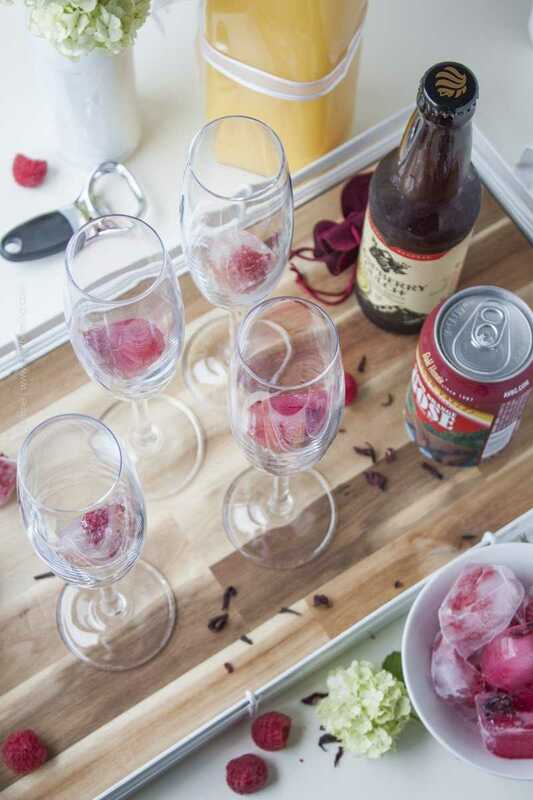 And…the hibiscus ice cubes I used in this beermosa version really took it over the top. TIP: If planning a beermosa bar consider making creative ice cubes in advance. You can use fruit pieces, dried edible flowers petals or certain compatible herbs. 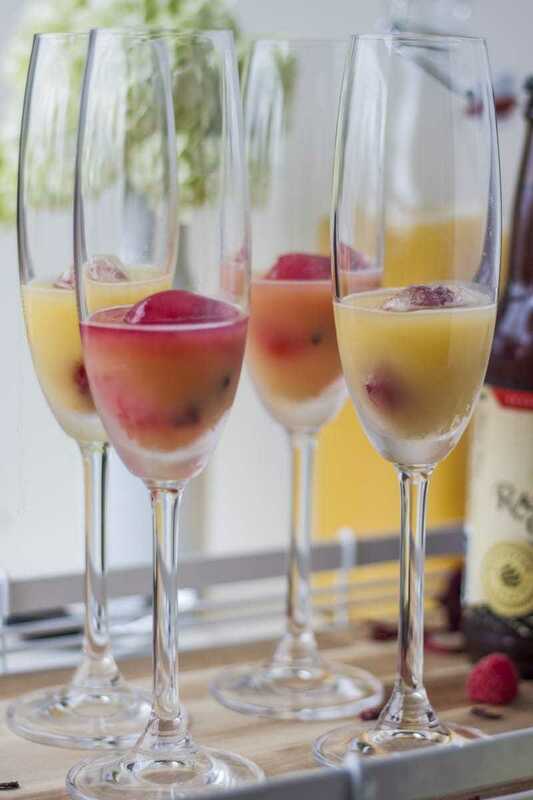 Not only will they add to the visual appeal of the cocktail but as the ice cubes melt the aromas of your chosen ingredients will be released and will add to the flavor experience of the beermosa. Step 2. Place an ice cube at the bottom of each glass. 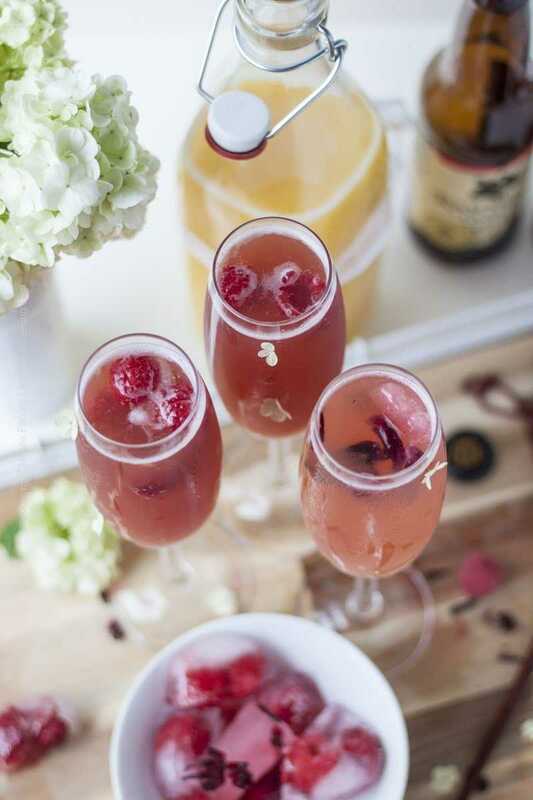 Champagne flutes are the best choice of glassware for beermosa. Step 3. Add a little orange juice to each glass. the goal is to let the flavors of the craft beer shine through. If you simply cover the ice cubes with juice that is enough. Step 4. Fill the rest of the glass with ale. The Blood Orange gose did get a tiny bit of red color boost once the hibiscus ice cube started melting, but very slight…it was pretty much balanced by the OJ’s yellow, so all in all…blood orange. A beermosa is a beautiful thing:) If you’ve never tasted one before – do try. Disclosure: I did have a glass while taking these pictures. It is part of my job description to taste everything I make in real time. Before you venture into your own beer and orange juice mixing adventures, I wanted to leave you with this handy list of most suitable craft beer styles to make a good beermosa. Here is a (perhaps) shocker. Certain dark ales make great contenders to the styles listed above. Sweet chocolaty ones (many porters and British stouts come to mind writing this) – think orange filled chocolates, and even chocolate stouts where the bitterness of the roasted barley in the grain bill in combination with some OJ will evoke almost edible images of dark chocolate covered orange peels. There is also the added benefit that a beermosa is not overly sweet and contains less alcohol than a traditional mimosa. So you can drink several without feeling tipsy. Which makes them a viable, refreshing day-drinking option on summer weekends..
Beermosa is the perfect brunch cocktail. 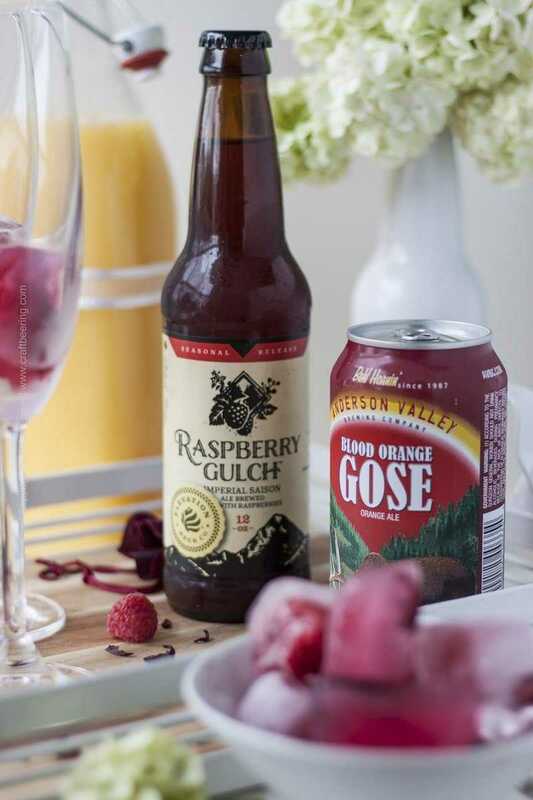 Use fruit flavored craft beer to create a decadent version of the classic mimosa. Start by placing an ice cube (if using) at the bottom of a champagne glass, add a splash of OJ and fill with chilled craft beer. Enjoy! 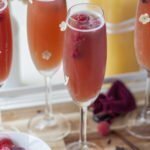 Fruited conditioned ales really shine through in beermosa cocktails - do not be afraid to experiment. Nutrition information is for guideline purposes only given that different beer styles have significantly different grain bills. A further complication is presented by attenuation based on the type of yeast used. Beermosa’s are a beautiful thing! Especially when sweet little flower petals can’t break away from the fun, either! Pretty pretty!! I’ve had my fair share of mimosas but I’ve never had a beermosas, now I’m craving both of these beauties. The flavored ice cube is a great treat. I am totally in the mood for brunchin’ this weekend and this beermosa is in order! We happen to have a blood orange in the fridge (saving it for some reason…guess cause they are so seasonal and so pretty). I think I’ve found the perfect use for it 😉 Happy weekend and cheers! Thank you, Dawn! Enjoy brunching this weekend! True confession time – me and regular mimosa’s steer clear of each other. Champagne is my nemesis, one sip and I’m a goner. Too much sugar for me. I don’t believe I’ve tried a beermosa before but it sounds ridiculously good and up my alley. Although I favor IPA I love trying craft beer in general so I’ll be on the lookout for the beer you choose in this post! I’ve heard of beermosas before, but never actually had one (most likely due to my weakness for champagne). 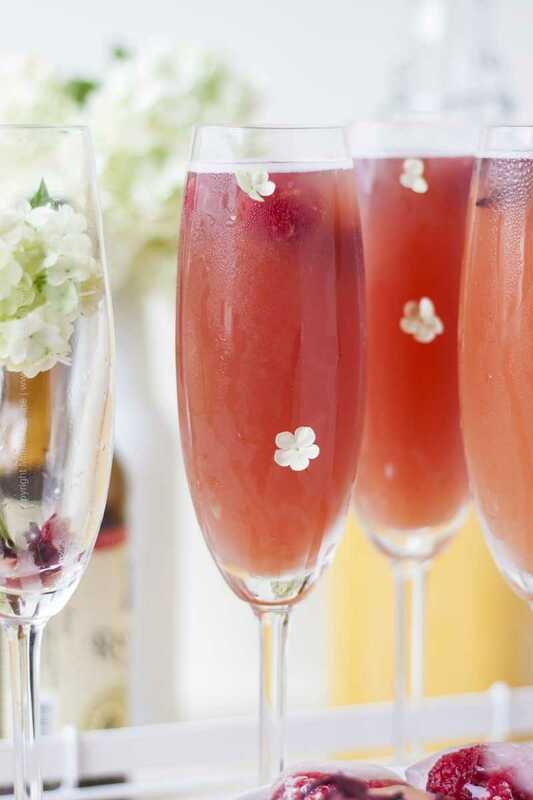 Love the idea of adding a little floral ice cube for some garnish. Thanks so much for sharing at the #happynowlinkup! These are gorgeous! I come from a total mimosa-loving family so I’m excited to share this twist with them at our next holiday :). YUM! Have a great weekend, Milena!